An enormous dust storm exploded on Mars three weeks ago, shrouding the planet in haze and raising the temperature of its atmosphere a whopping 30 degrees C.
July 16, 2001: Mariner 9 arrived at Mars in 1971 -- the first spacecraft to orbit the Red Planet. Scientists were anxious to study the crisp new pictures it was expected to send back. Much of Mars had never been seen in any detail, and Mariner 9 would lift the veil at last. Their feelings must have been mixed indeed when the first images arrived at mission control and revealed .... a world-wide haze. The surface of the entire planet was hidden by the biggest dust storm anyone had ever seen! Only Olympus Mons, a giant volcano 24 kilometers high, peeked above the clouds. After a month the dust settled and Mariner 9 mapped the Red Planet with great success. Scientists have since learned that huge dust storms, dwarfing desert dust clouds on Earth, are fairly common on Mars. The Mariner 9 event still holds the record as the thickest and longest-lasting we have observed -- but perhaps not for long. 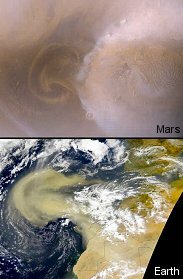 Above: On June 26, 2001, the Hubble Space Telescope spotted a dust storm brewing in Hellas Basin on Mars. A day later the storm "exploded" and became a global event. Three weeks ago a new dust storm erupted on Mars. It's the largest in 25 years and still growing. The storm is so big that amateur astronomers using modest telescopes can see it from Earth. And the cloud has raised the temperature of the frigid Martian atmosphere by a stunning 30 degrees Celsius. Now that's global warming! Enjoying the best view of the storm is NASA's Mars Global Surveyor in orbit around the Red Planet. The spacecraft carries an instrument called "TES" -- short for Thermal Emission Spectrometer -- that can measure the temperature and dust content of the Martian atmosphere on a daily basis. "This storm began as a small dust cloud inside the Hellas Basin, a 9-km deep impact crater in Mars's southern hemisphere," says Phil Christensen, the principal investigator for TES at Arizona State University. At first the cloud did little -- alternately growing and retreating as days passed, but never getting very large until June 27th. "That's when the storm exploded," says Christensen. "It crossed some critical threshold and really began to grow." By early July the dust cloud had spilled out of the Basin and wrapped itself around the entire planet. (210 kb). Credit: the Arizona State University TES Team. "This is a big deal," says Christensen. 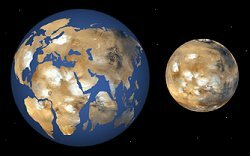 Although Mars is smaller than Earth, its surface area equals the sum of all the continents on our planet. Imagine a dust storm on Earth that blanketed every continent at once. Its enough to make an allergy sufferer shiver (and sneeze). No one knows exactly how Martian dust storms grow to such proportions. Says Christensen: "One theory holds that airborne dust particles absorb sunlight and warm the Martian atmosphere in their vicinity. Warm pockets of air rush toward colder regions and generate winds. Strong winds lift more dust off the ground, which further heats the atmosphere." It's a positive feedback loop that can transform tiny dust clouds into globe-swallowing storms. First, Earth isn't a global desert like Mars. Most of our planet offers little fuel for self-sustaining dust storms. For example, winds in the Gobi desert frequently stir up dust clouds that migrate over the vast Pacific Ocean. With no source of dust to feed them from the ocean below, such storms quickly die. Second, dust clouds don't raise the temperature of air on Earth as they do on Mars. "The temperature of Earth's atmosphere is controlled by the latent heat of water vapor," explains Christensen. "Airborne dust can't compete." On Mars, however, sunlight-absorbing dust can substantially heat the dry, thin atmosphere -- raising winds and, of course, more dust. "The global air temperature on Mars is now about 30 degrees C higher than it was before this dust storm began," notes Christensen. (70 kb). Credit: the Arizona State University TES Team. The ultimate energy source for Martian dust storms is sunlight. For that reason the dusty season on Mars begins each year near perihelion, the planet's closest approach to the Sun. Mars will be at perihelion on October 12, 2001. "The biggest dust storms don't usually begin until one or two months after perihelion," notes Christensen. "This one coming so early in the season makes me think Mars is heading for a spell of big dust storms." Not only is Mars near perihelion, it's also near Earth. Just now the two planets are closer than they have been in about a dozen years, which makes Mars unusually big and bright in the midnight sky. Before the ongoing dust storm began, a modest 8 or 10 inch telescope trained on Mars would reveal dark markings and polar caps. "But now," says Christensen, "those details are fading away as dust fills the air. Martian dust is made of the same rust-colored stuff that covers the ground, so the planet is looking pretty bland." Above: Tan Wei Leong of Singapore captured this image of dust-shrouded Mars using an amateur 11" reflecting telescope on July 12, 2001. Credit: Association of Lunar and Planetary Observers. A human explorer on Mars during such a storm would surely think the planet gloomy -- perhaps even a bit depressing. But the gloom might be less vexing than the dust itself. Fast-blowing (60 to 100 mph) dust particles can gum the joints of spacesuits and infiltrate cracks in doors and windows -- a real nuisance for future colonists. And the nuisance wouldn't be short-lived, because once underway Martian dust storms don't quickly end. "Big events tend to last for weeks or months," says Christensen. "In fact, we're not certain what makes them stop." Perhaps, he speculates, when the whole planet is shrouded, strong thermal gradients in the atmosphere subside -- winds die down and the dust settles. Right: The land area of Earth is approximately equal to that of Mars, but dust storms are generally smaller here because Earth is not a global desert. Like its predecessors, the ongoing dust storm is unpredictable -- no one knows when it will end. Indeed, it could be just the first of a series. "Energy in the atmosphere from one storm makes it easier for the next dust storm to begin," Christensen explains. No matter what happens, though, researchers are delighted. "Atmospheric scientists have been waiting for a beautiful storm like this," says Christensen. "The data we're collecting are marvelous, and I suspect there will be a rush of papers in the months ahead answering some of the questions we have about these events." What an irony! An impenetrable haze around Mars will help scientists finally clear the air -- and understand the biggest dust storms in the solar system. Editor's Note: You can monitor the ongoing storm yourself. Simply look at Mars through a telescope. Are markings on the planet crisp and distinct -- or hazy? Click here for observing tips. Thermal Emission Spectrometer - Scientists are using "TES" -- an Arizona State University-built instrument on board NASA's Mars Global Surveyor spacecraft -- to monitor the ongoing dust storm. All the World's a Stage .... for Dust -- Tune in to a NASA website and watch giant dust clouds as they ride global rivers of air, cross-pollinating continents with topsoil and microbes. Mobile Homes for Microbes -- African dust that crosses the Atlantic and brings beautiful sunsets to Florida also carries potentially harmful bacteria and fungi, a new study shows. The Pacific Dust Express -- North America has been sprinkled with a dash of Asia! A dust cloud from China crossed the Pacific Ocean recently and rained Asian dust from Alaska to Florida. of Mars. A day later the storm erupted and became a global event. Mariner 9 mission to Mars -NASA's Mariner 9 spacecraft arrive at Mars in 1971, right in the middle of a global dust storm.